Introducing a splendid 2 Bedroom layout at the Charleston Chew Lofts. This floor plan offers complete room separation with each bedroom allowing for its own direct access to the centered bathroom. With bamboo flooring throughout & sand blasted exposed beams and ceiling, this loft is an urban gem. Metropolitan made Maple kitchen cabinets, granite counters & stainless steel appliances create a clean sleek look while the 11 foot exposed grey brick wall encases a 3 panel glass slider leading to a private balcony. 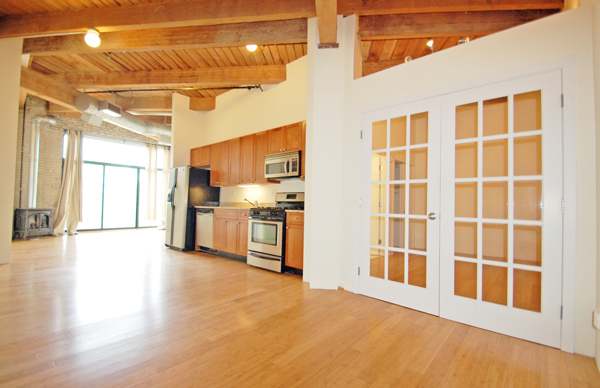 This North West facing loft provides an open concept while simultaneously offering the flexibility of 2 bedrooms. To the left of the slider is a useful wood-burning stove. Enter the Master Bedroom via a 12 light glass French door. BR is equipped with a large custom closet, a ceiling fan with along with direct bathroom access. Equipped with an in unit washer dryer, private balcony and deeded parking, if you've looked for a comfortable 2 bedroom true loft near Boston, look no further.